A bed overhung by Ash and Hawthorn trees comes into its own in spring. The season starts with snowdrops and Winter Aconites (Eranthis hyemalis), so pretty with an "Elizabethan ruff" of leaves surrounding each single yellow buttercup-like cupped flower. Both the aconites and a variety of snowdrops were given to me by my mother, Mary Adams, like so many of my plants. The aconites are spreading very slowly- they would do better in a bed with more humus. Clumps of double snowdrops, Galanthus nivalis 'Flore plena', have spread under the orange-stemmed Cornus sanguinea 'Midwinter Fire'. 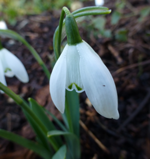 This bed also has a reasonable clump of an unnamed large single snowdrop (a plicatus variety) as well as a few of the tall Greatorex double 'Ophelia' and the early flowering double 'Lady Beatrice Stanley'. (Lady Beatrice propagated snowdrops at her home in Northamptonshire). My Helleborus orientalis come in shades of pink, purple, yellow and white with and without spots. The mysterious plum-coloured Helleborus x hybridus "Harvington Shades of Night" is especially striking. I also have a rather lovely frilly double, Helleborus x hybridus 'Cinderella', but, on the whole, I prefer the simplicity of single flowers- and so do the bees. The central focus of the bed is a small tree, Amelanchier x grandiflora 'Ballerina', which has taken time to settle (I think it prefers acid soil). Bronze-tinted young leaves set off the star-shaped white flowers in spring, while in autumn the leaves take on rich tones of orange and red. By March, the bed is a riot of blues, creams and yellows with golden leaves of Valeriana phu 'Aurea' and Melissa officinalis 'Aurea', Narcissus 'Tete a Tete', Euphorbia amygdaloides (Wood Spurge), Geum 'Yellow Drops', Lunnaria annua 'Alba variegata' (which should seed true), and Pulmonaria 'Bowles Blue' (a bit too pale). A vigorous blue Veronica peduncularis (also from my Mum, so I am not sure of the variety) creeps along the front edge.